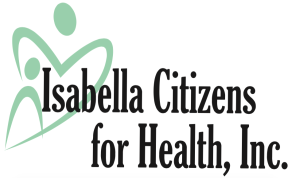 Patients and Funding - Isabella Citizens for Health, Inc.
Isabella Citizens for Health, Inc. (ICH) is a not-for-profit 501c3 organization that operates a a Federally Qualified Health Center. ICH's main focus is to serve all people of all ages regardless of health insurance status. The Health Center continues to depend on grants, donations, and other forms of funding to assure services and programs are available to all people. Each month more people in the Isabella County area are utilizing the health center for primary medical care and choosing our health center as their medical home. As we continue to serve all people regardless of ability to pay, we continue to need financial support. If you would like to help, please consider making a donation today.